Rowing is a great way to get fit active and sociable and, being one sport the British are known for being good at, follow in the oar strokes of our Olympic champions. Rowing is an Olympic team sport in which rowers race against each other in long narrow oar-propelled row boats. Rowing is a low impact, and therefore safer, sporting exercise because with the body weight being supported by the boat very little stress or strain is put on the joints. It also uses more muscles than any other sport, with the primary beneficiaries being the legs, back and arms, and is a lauded way to improve health and fitness. Once proficient, rowers can expect to burn off between 500 and 600 calories per hour. A typical Olympic rower is tall and very muscular. World-class rowers need to have long ‘levers’ (arms and legs) to enable to them to make long strokes. For instance the greatest male rowers tend to be very tall, typically between 6’3” and 6’5”. They are also very strong so they can apply a lot of force to the water on each of their strokes. World-class rowers may be heavy but that is not fat baggage, but pure lean muscle. Beginner rowers are obviously not expected to turn up the readymade Olympic athlete, it first takes a lot of time and effort, but they should be fairly healthy. Nevertheless one of the bonuses of rowing is that participants get better as they get fitter. The best way to start competitive rowing is to join a local rowing club. Most major towns and cities in the UK support at least one rowing club, and all will welcome beginners with open arms. There is no need to splash out on any expensive equipment and training beforehand, as this will all be provided by the club. Rowing clubs are also renowned for being sociable and provide a great way to meet both future rowing teammates and drinking pals. Novice rowers should begin by declaring any relevant health problems to the club as they will usually make the appropriate provisions to allow those with health problems to take part safely. Beginners must also be able to the complete the minimum swimming distance as decided by the respective club. New members will be expected to complete a swim test before getting into any vessel. They should then be trained in capsize and immersion procedure. 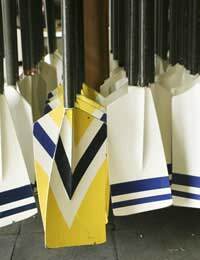 As rowing equipment is fairly standardised, and dictated by the club, the rower can instead fret about the appropriate clothing to wear. The standard racing uniform is an all-in-one close fitting garment that allows easy unrestricted movement. These garments are ideal for races and warmer weather but not always appropriate for training the year around. Wearing only an all-in-one is not adequate in cold weather and could lead to muscle injury. Rowers are advised to make sure their all important arms and legs are kept warm by wearing a thin first thermal layer beneath a close fitting tracksuit or several light layers. Appropriate headgear will stop half of the body’s heat being lost. In hot weather rowers need to wear clothing that will not only keep them cool but protect them from exposure to the sun. They should also wear sunglasses to reduce the glare from the water. Needless to say all loose fitting, baggy clothing is inappropriate, as are bulky items that absorb water when wet and everyday casual clothes. In all seasons rowers should carry a bottle of water with them as dehydration will impair performance and could lead to heat stroke and exhaustion.